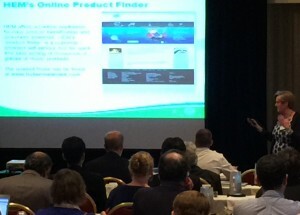 Huber’s Yann Bourgeois (standing) explains the benefits of the new Safire™ nitrogen-phosphorus fire retardant additive technology during her technical presentation to attendees. 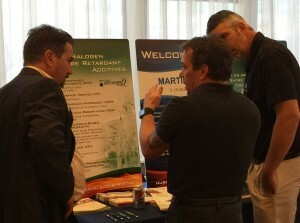 Huber’s Stan Kramer (left) and Mark Herndon (right) discuss Huber’s comprehensive fire retardant additive portfolio to an attendee at AMI’s Fire Retardants in Plastics event. It’s been a very busy two days for Huber Engineered Materials in Pittsburgh, Pennsylvania (U.S.) exhibiting at Applied Market Information’s (AMI) annual Fire Retardants in Plastics event. Discussion at Huber’s exhibition booth has centered on the recent acquisition of the Martinswerk halogen-free fire retardant and specialty chemical businesses and our new Safire™ nitrogen-phosphorus fire retardant additive technology. In addition, Huber Technical Sales Manager Yann Bourgeois gave an informative presentation on Safire, explaining to the over 200 attendees the advantages the Safire products will offer once commercialized. It’s always great when we are able to meet with customers and prospective customers, particularly at a smaller conference like Fire Retardants in Plastics. During the event, attendees had the opportunity to learn new developments and trends in fire retardants while at our booth we enjoyed discussing our comprehensive portfolio of halogen-free fire retardant additives.